We are sorry but prices have changed due to unforseen increases in the cost of lenses, screens and other related parts. Please contact us and we will get the current price for you. Ideal unit to view aperture cards! The Indus 456-800e Engineering Drawing Reader is an ideal unit to view aperture cards and related engineering documentation. Its hood shields the ambient light from the bright, but evenly balanced, 20″ x 13″ screen. State-of-the-art technology combined with ergonomic design and contemporary appearance create a rear-projection reader that is easy on the eyes. 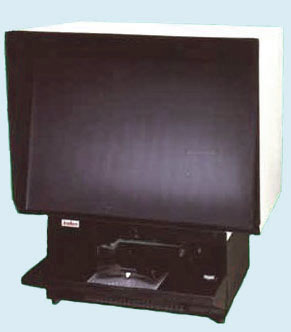 The 4601-03 (14″ x 11″ screen) Aperture Card Reader accommodates aperture cards, COM, fiche and jacketed source document information and features a dual lens system to give you more viewing versatility. The removable power drawer also gives you the advantage of no down-time. Optional – 24x, 32x, 37x, 42x, 48x, 54x, and optional 72x as alternates to 21x. Optional – 105mm x 152mm (4″ x 6″) self-opening or 105mm x 152mm dual (4″ x 6″) self-opening. 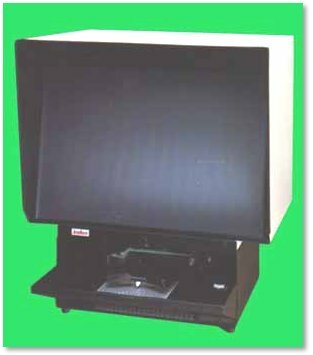 The 456D-800 Double Page Reader provides convenient, simultaneous access to two pages of information, making it ideal for catalog or spec-sheet reading. A special feature of this viewer is that it provides 120% blow-back for detailed viewing of parts and schematics. 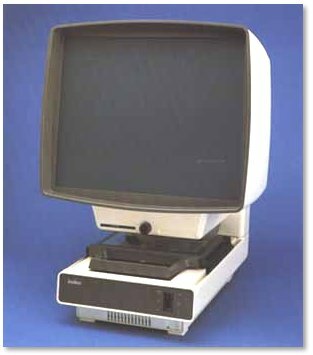 It accommodates all standard formats including microfiche, jackets and aperture cards.